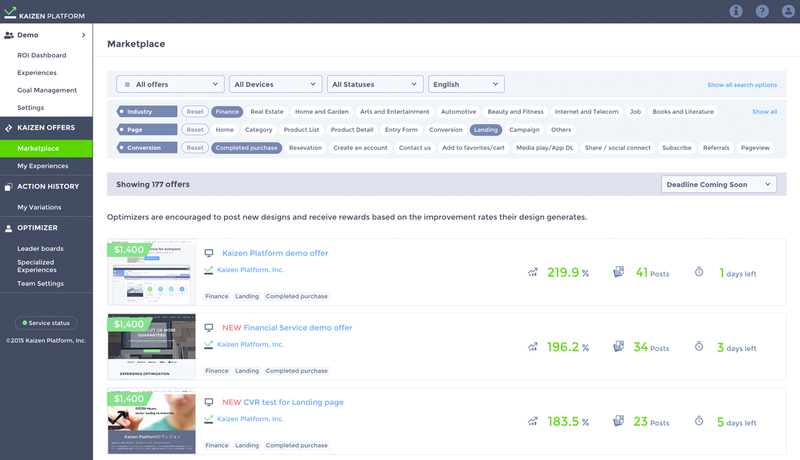 Kaizen Platform releases filter, sort, and search functions for Marketplace. You can now filter and search offers in the Marketplace by industry, page type, and conversion goal. With these new functions, you can easily discover websites that were previously optimized through Kaizen Platform and quickly find offers based on your interests and skill set. ※ Default tags have been set by Kaizen Platform based on customer use. If you wish to change tags, you can do so on the Settings page. For more details visit the Help Page for Marketplace. Thank you for using Kaizen Platform. If you have any questions please contact us through our contact form or chat.